These smallish round beans are sorted out and set aside during the harvest and are highly prized and relatively scarce. We have cupped a number of peaberry coffees at Lakota Coffee Company with fantastic results. Our customers rave (we love it when they do that!) and so we keep searching out great peaberries from our green coffee importer. ARE PEABERRIES HEAVEN OR ARE THEY HYPE? I have personally experienced many different peaberries in my 12 years in the coffee business. Kona, Tanzania, Zimbabwe, and Zambia were the most memorable of the bunch. If you have a magical mind or prefer to see life as being somewhat mystical, then more than likely, that's the way you'll experience the peaberry! Or maybe, you'll simply prefer to think of them as being mystical...well... just because it's good clean fun! One thing for sure, pea-berry coffees are consistently extraordinary! "In the United States a very popular coffee is the Tanzanian Peaberry. Why? Well, a couple of theories about that one. Pea-berries seem to have a mystique about them. What's a peaberry? It's when a single bean develops inside the coffee cherry, instead of the familiar two "flat beans". Why so many fans of the peaberry? The theory is that all the goodness of the coffee cherry is in only one bean. 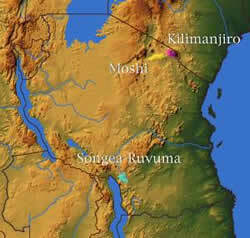 Another reason for the popularity of the Tanzanian peaberry is simply a factor of supply. The Japanese buy the bulk of Tanzania flatberries (regular coffee beans) and since the pea-berries have been sorted out, a market was needed for them. Since peaberries have the cult following mentioned above, Viola! The Exotic Tanzanian Peaberry! Hence, with the exotic name (Tanzania) and the peaberry factor, we cup and cup to find those cups that truly deserve the praise, and are not just a function of the hype!" So, once again we are reminded of the absolute importance of having an excellent importer on your team, that is, if your goal is selecting from the best coffees obtainable. The ability to source your coffee from a company that has absolute dedication to quality and bases ITS success entirely on the expert cupping skills of an outstanding green coffee importer is one of the key advantages of this site! Simply put, you have the opportunity to confidently taste-test your chosen coffees, "to your hearts content", from a selection of the very best of the best the world has to offer, peaberry or otherwise! 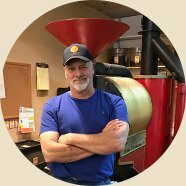 Go To Specialty Coffee Advisor - HOME PAGE!